The top of your pizza box is one of the most important tools in your pizzeria marketing arsenal. Your pizza box becomes a moving billboard for your business the second your pie leaves the front door. If your pizza box is generic, flat, boring and lifeless it isn’t working for you, it’s working against you. Research shows that a custom designed pizza box generates more impressions than all other pizzeria advertising and signage combined. 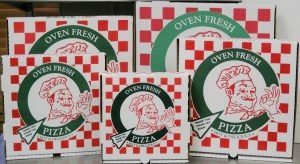 At BOVA Foods, we can easily design custom-made pizza boxes for your restaurant that are eye catching and attention grabbing so you can make the most out of this opportunity. All it takes is a unique design to separate your message from the competition and have your pizza box working for you. 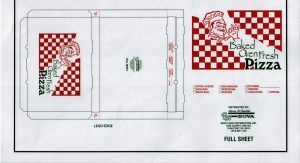 Whether you want a pizza box that features information about your quality ingredients or a box that features built-in coupons, BOVA Foods can easily design custom-made pizza boxes for you. If you sell pizza then pizza boxes are a necessity. 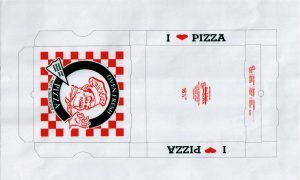 Let BOVA Foods help you extend your brand into the homes of your customers with a custom pizza box. Are you currently using a custom box? What is your weekly volume?